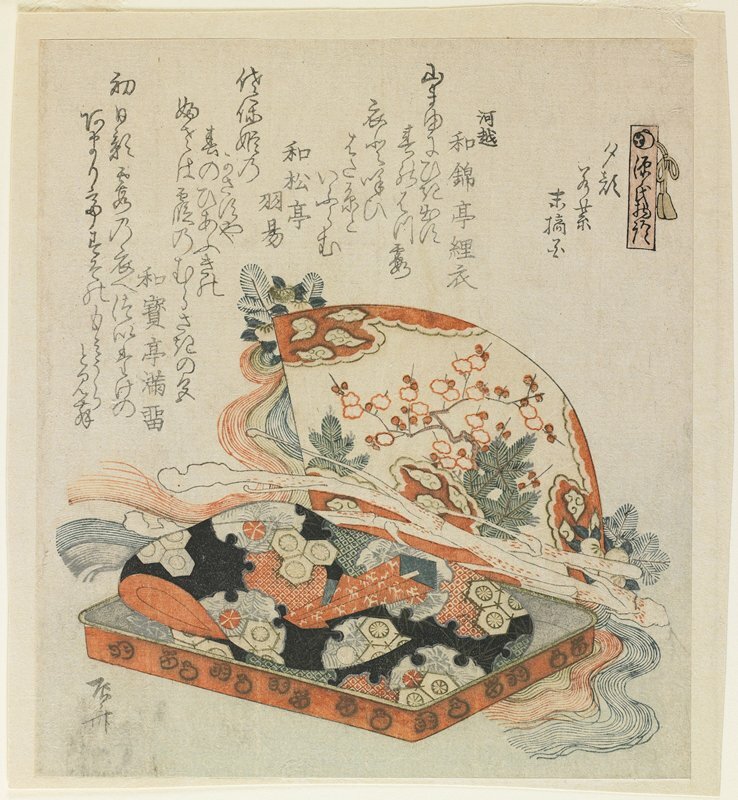 The objects and the three poems above them make reference to three successive chapters of The Tale of Genji, chapters 4, 5, and 6, each of which details Genji’s initial encounter with a girl. In chapter 4 he meets Yūgao (“Twilight Beauty”), who dies soon after they’ve made love, having been possessed by the spirit of one of Genji’s earlier lovers. In chapter 5 he meets Murasaki, a young girl who resembles Genji’s own stepmother, with whom he had an earlier affair. Genji abducts Murasaki and, though they never marry, she becomes the most important love of his life. In the next chapter Genji meets Suetsumuhana (“The Safflower”), a girl of high rank but who lacks grace and thus does not attract Genji. The Chapters "The Twilight Beauty," "Young Murasaki," and "The Safflower"